These high-quality, mortar mixers provide laboratories with the best quality mixers available. All mortar mixers provide 5 liter capacity and two-speed design. Mixers feature a 5-liter, stainless steel bowl and ASTM compliant paddles. Provides automatic program control with auto sand feed and water supply and manually-controlled cement supply. Heavy-duty construction of aluminum and cast iron provides durability for a long, dependable service life. These mixers are designed to provide accurate and repeatable results for ASTM (C305 and C277) and other international standards. Mixers feature open mixing bowl for easy, visual consistency control and the planetary gearing and toothed belt drive on most models ensure quiet and maintenance-free operation. Standard distance between mixing bowl and stirrer is 3 ±1mm and this distance can be maintained with fine adjustments made with a simple tool. 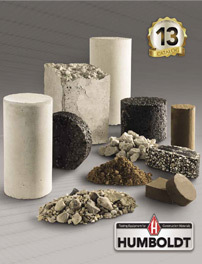 If you are looking for the best mortar mixes available, just look below. Humboldt provides a variety of mortar mixers to choose from. If you have questions or need help selecting equipment, please call us at 1.800.544.7220 or use our Quick Response form.